Every year when spring finally arrives I start fantasizing about having breakfast out on the patio. But then reality hits. I am not a morning person and the logistics of pulling together a breakfast and serving it on the patio before lunch time is overwhelming. This weekend I came up with an easy solution: Breakfast wraps! 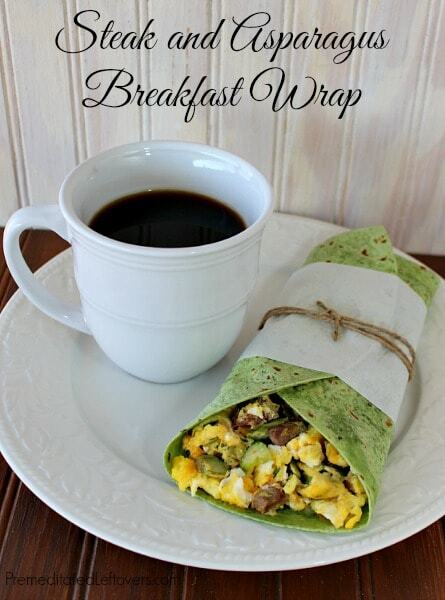 Breakfast wraps can be quickly and easily assembled inside and then enjoyed on the patio with a cup of coffee or juice. No utensils are needed. I don't have to cart out syrup and butter. Just a simple and delicious breakfast that I can savor while enjoying a beautiful spring morning. 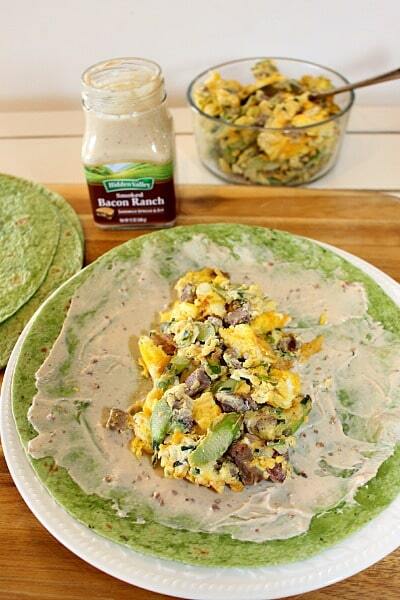 You can make a breakfast wrap with just about any combination of meat and vegetables. I had some leftover steak from grilling the night before and some fresh asparagus, so I made a Steak and Asparagus Breakfast Wrap. I used Hidden Valley Smoked Bacon Ranch Sandwich Spread & Dip to easily add a flavorful punch to the wrap. The wrap tasted like I spent a lot of time creating it, but I didn't have to dirty an extra pan and deal with bacon grease to add the bacon flavor to my breakfast wrap. Saute the chives and asparagus in olive oil. 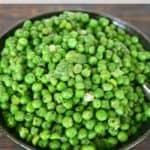 Once the asparagus is fork tender, add the diced steak and cook it until it is heated through. Then add the egg and cheese mixture and scramble the eggs. 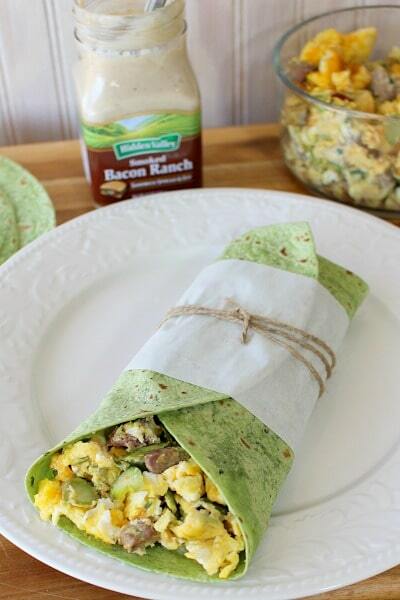 After the scrambled eggs are done cooking, you can use them to create a breakfast wrap. Take your tortillas and spread 1 – 2 tablespoons of Hidden Valley Smoked Bacon Ranch Sandwich Spread on each of them. Then add the scrambled egg mixture. 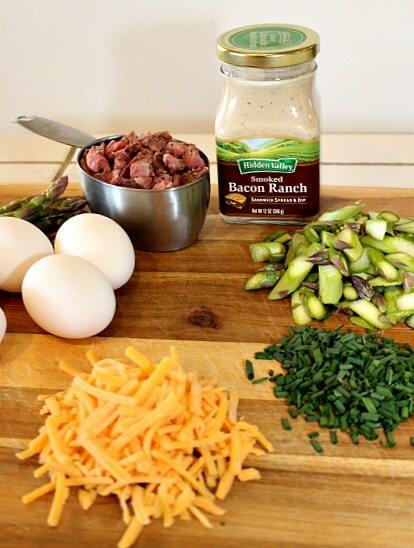 The Smoked Bacon Ranch Spread is going to blend with the flavors of the steak and asparagus to take your breakfast wrap to a whole new level of deliciousness! Do you fold or roll your wraps? I fold mine. I fold the bottom up and then fold one side across. Then I fold the other side over. I leave the top open. I have found that the tortilla is less like to tear if I keep the folding to a minimum. Have you ever had a wrap come apart while you are eating it? It's not fun and there is a simple fix. 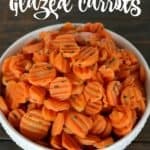 After you have rolled it or folded your wrap, put a piece of parchment paper or wax paper around it and then tie it with some cooking twine. This will hold your wrap together and keep your filling inside the tortilla where it belongs. Over a medium flame saute the asparagus and chives in olive oil until the asparagus is fork tender. Add the steak and cook until heated through. Add the eggs to a medium bowl and whisk until they become lighter in color. Stir in cheese, salt, and pepper into the beaten eggs. 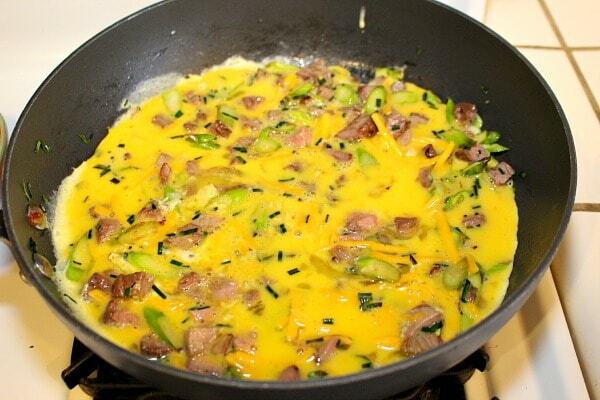 Pour the egg mixture over the asparagus and steak. Cook over a medium-low heat without stirring until the eggs start to set on the bottom and around the edges of the pan. 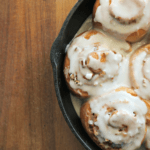 Using a spatula, gently lift and fold the egg mixture, so the uncooked mixture runs underneath and onto the pan surface. You may have to use the spatula to lift the cook eggs and let the uncook eggs run underneath to the pan a couple of times. Try not to over stir your eggs when cooking them. You want to keep the curds as large as possible.Cook for 2 –3 more minutes or until the eggs are thoroughly cooked. Spread 1 - 2 tablespoons of Hidden Valley Smoked Bacon Ranch Sandwich Spread & Dip on each tortilla. Divide the scrambled egg mixture between the 4 tortillas. Fold or roll the tortillas. If you wish, wrap parchment paper around the wraps and secure with twine.